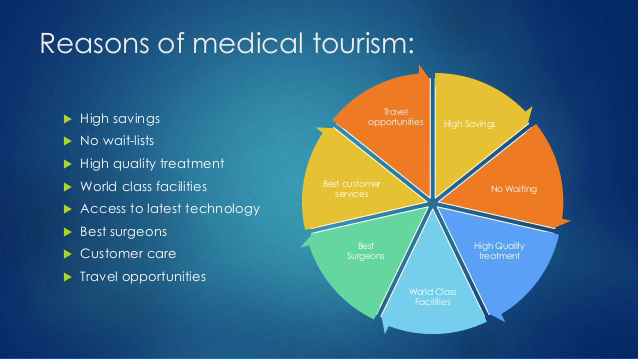 "Medical tourism" refers to traveling to another country for medical care. It's estimated that up to 750,000 US residents travel abroad for care each year. Many people who travel for care do so because treatment is much cheaper in another country. The most common procedures that people undergo on medical tourism trips include cosmetic surgery, dentistry, and heart surgery. Puerto Rico enjoys competitive advantages that few competing medical tourism destinations can match, especially when it comes to tapping the vital U.S. mainland market. As a U.S. territory, no passport is required for U.S. citizens. Puerto Rico can offer top-quality care at prices 40 percent to 80 percent lower than those in mainland hospitals. Puerto Rico’s Joint Commission-accredited hospitals and healthcare professionals, including board certified doctors, are held to the same high federal regulatory and safety standards that apply stateside. A manageable flight from most airports in the U.S.. Puerto Rico offers the perks of near perfect weather most of the year. English speaking community(particularly when it comes to medical staff). Of course, one of the most alluring reasons to travel for your medical needs is the chance to enjoy a much-needed holiday after you’re discharged. And Puerto Rico offers plenty of options for leisure, rest and relaxation. Dreams Hotel, centrally located nearby certified hospitals is a perfect option, for medical tourism. Offering a nice, clean, a centrally located facility, for a very reasonable rate per night, is a perfect option.